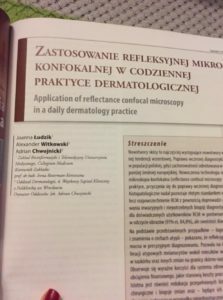 We invite you to read an article published in the latest issue of the Practical Dermatology magazine Dermatologia Praktyczna The article is co-written by our specialists Joanna Łudzik, MD and Alexander Witkowski, PhD MD. The article describes the practical application of confocal microscopy as a way of modern diagnosis of malignant skin changes. It is a non-invasive examination which allows for a precise lesions imaging and a better recognition of characteristic features, which improves the accuracy of the diagnosis and helps learn about the skin biology. We invite all patients concerned about their skin marks to have them examined at SportMedicum! © 2017 Sport Medicum. All rights reserved.